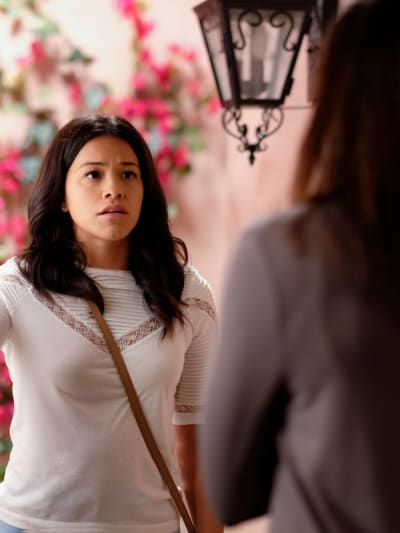 Catholic guilt, normal guilt, Jane experienced it all on Jane the Virgin Season 5 Episode 2. And how could she not? She’s built up this great life with Rafael, but she feels guilty about it because of Michael’s return. And though she should be happy Michale is alive, she’s also made so much progress to get over him, and now, he’s messing up all of that progress. Not intentionally, of course, but it’s still happening. This had lead Jane to she unwillingly wish that he never came back, which, in turn, makes her feel even more guilty. At the same time, she knows that if Michael were to get his memories back, she could very well develop feelings for him again, which increases her guilt because of her love for Rafael. Rose: Did you come to thank me? I took out the competition. Got you the girl. Rafael: Why did you wipe Michael’s memories? Rose: Is that really what you want to ask me? Or are you trying to find out if what I did to Michael is reversible? Afraid that if Michael gets his memory back, Jane will go running back to her one true love like she always does? On top of it all, she hasn’t even tried to get to know Jason thus not helping him regain his memories at all. Oh, and did I mention the lawyers said they are still legally married? Oy. That’s a lot for one person to handle. And somehow, Jane’s still doing an incredible job. Sadly, there are no winners here. None of them — not Michael, not Rafael and not Jane — deserve to be in this situation. Everyone’s reality has been turned upside down, and it’s becoming increasingly difficult to see the silver lining. It’s easy to ignore Jason’s plight because he hasn’t been acting like Michael at all and we never saw what happened to him. To help viewers fully understand what Michael-Jason has been through, I really think the writers need to give us a glimpse of his kidnapping and brainwashing at the hands of Sin Rostro. But just because he isn’t Michael, doesn’t mean he doesn’t feel the pressure of his new reality. Up until two weeks ago, Jason had a life in Montana, never knew about his wife, and assumed he had been a bad person in his previous life. Jane: Trust me, he needs that dog because he is not a people person. Petra: Maybe he’s just not a Jane person. Permalink: Maybe he’s just not a Jane person. Surprisingly, it was River Fields who helped him realize he was also a victim in this situation, and that forced Jane and the writers to explore who this new iteration of Michael is now. If Jane wanted to help Jason, she had to get to know Jason. And boy, was that fun and unexpected. When Jason finally opened up, he was a hoot! Pickle backs and all! 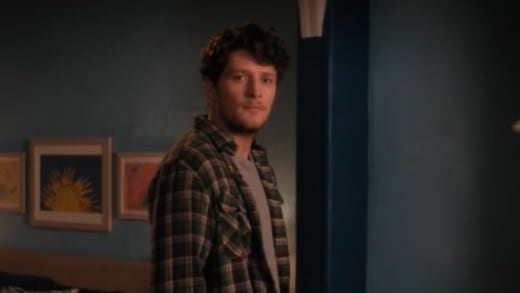 If Brett Dier is going to portray a character with amnesia, we should at least be able to have fun with it. And what’s better than seeing him line dance with fervor? Unfortunately, Jason began feeling a spark with Jane — turns out, he is a Jane person — and planted a kiss on her. Initially, I thought maybe he was trying to see if that would trigger a memory, but nope, he played the “you’re my wife” card like he was up to something evil. Technically, the papers may reflect that she’s married, but she’s married to Michael, not Jason. You can argue that they are the same person in the flesh, but that dude is not Michael, which makes a huge difference. The fact that Jane didn’t feel anything but anger and the need to tell Rafael the moment it happened makes me think that there’s no way she’d ever get back together with Michael, even if he did get his memories back. Her love for Rafael is boundless. And she’s not only protecting him and her relationship, but she’s also protecting her family. Jason’s move on Jane only added fuel to Rafael suggestion that she should file for a divorce. A part of me really understands where Rafael is coming from. That’s his girl, and he doesn’t want to lose her. But his request may have been borderline demanding, especially knowing how frowned upon divorce is in the church. Jane claimed that she didn’t want to divorce Michael because it went against her religious beliefs, but really, a different form of guilt was consuming her. She made a promise to be there for Michael in sickness and in health. Sure, “till death do us part” may have negated this promise, but he’s back, and technically, sick. What kind of wife would she be if she just gave up on Michael because he had amnesia? And what would she tell him if his memory did come back? Seriously, it’s only been two weeks. I’m a Raf supporter, but going along with Jane’s character, I fully expected her to at least try everything before throwing in the towel. However, after that kiss, Jane knew she had to pull the trigger to preserve the life she’d built with Rafael. Her decision surprised me, but not more than Alba’s acceptance did. I really thought she would look down at Jane and tell her to give it some time. It hurt seeing Rose feed on Rafael’s insecurities knowing how torn up he was about Jason’s return. She was so cruel when she told him if Michael’s memories came back, Jane would run back to her “true love” like she always did. But wait … was that foreshadowing? She said Michael was Jane’s true love. Does that mean he’s endgame? Jane: Well, she had a puppy, and the puppy died. So she got a new puppy. But then, out of nowhere, the other puppy was found. Jane: No. Not like Moses. In Montana. The point is, now she has two puppies, but her parents won’t let her have two puppies, so what’s the plan for that? Jane: Exactly. Because there is now plan. My friend has to come up with a plan. But religion makes it seem like it will all magically work itself out which is totally false. Jane: Yes. You know, you may be a little too young for CCD. You’re not going anymore. Mateo: Okay. Do you think we could have the other puppy though? Permalink: Yes. You know, you may be a little too young for CCD. You’re not going anymore. If you’ve read my recent Mateo Sr. is alive and Rose is related to Rafael theory, this scene only fueled my beliefs. The way Rose spoke to Rafael reminded me of a sister gleefully tormenting her younger brother. Why was she so pleased with how much pain she was causing Rafael? You know, aside from being an evil villain who preys on people’s pain. Related: Is Mateo Sr. 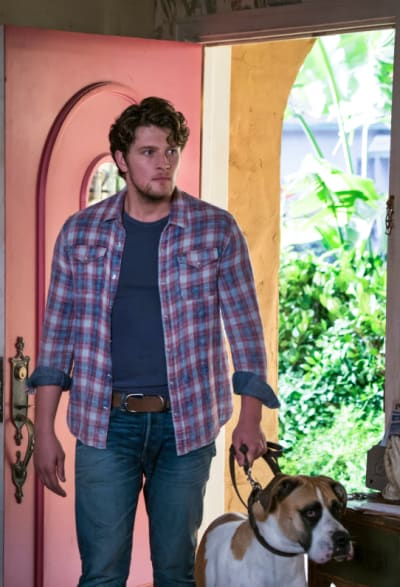 Alive on Jane the Virgin? The worst part about all of this is that Rose didn’t really have a motive for the suffering she caused Michael and his loved ones. At least, not a reason she was willingly going to share with Rafael and Luisa. If she’s telling the truth about giving Michael amnesia just because he may have seen her mask peel off at the coffee shop, I’m going to be livid. There are so many possibilities here, but a random attack just doesn’t make sense nor does it align with her previous motives. Why would she go through the trouble? And what’s with the number Dennis gave Luisa? Frankly, I don’t buy it what Rose is dishing. There has to be a bigger play in motion, one that may include Mateo Sr. (if he’s alive…)! And what was Rose’s purpose for bringing Michael back into the fold? No villain would do that without an ulterior motive. Which leads me to that final seem with Michael lying about the dog eating his divorce papers. I’ll say it again — what the hell, Jason? Initially, Michael seemed indifferent to finding out his backstory or reconnecting with Jane, but after that kiss, he suddenly didn’t want a divorce. Did he simply develop feelings? Or does it have to do with Rose’s overarching plan? The way he looked at those papers was sinister, and I’m no longer having good vibes about Jason being innocent in all of this. Other possibilities include Michael faking amnesia this whole time or having regained them halfway through but not speaking up because of how happy Janes seems. Regardless, something seems off about this haste turn of events, and I hate to say it, I don’t trust Jason even more now. 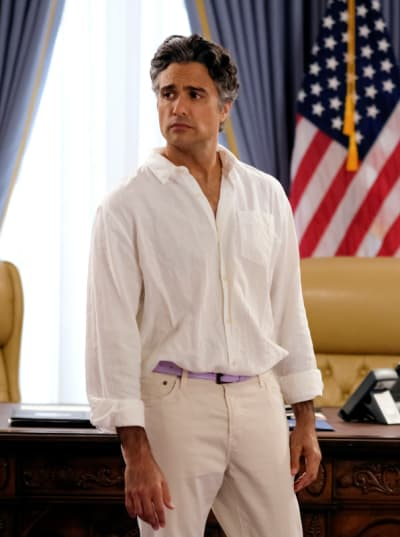 By Jane the Virgin Season 5 Episode 3, there needs to be some kind of resolution and forward movement. Either Michael needs to remember his past or he has to be exposed as a double agent working for Rose. And there’s obviously Rose’s minion interjecting himself into Luisa’s life as her friendly pie-baking neighbor proving that she’s definitely up to something shady. Jane: What do you mean you’re out? Michael: I don’t wanna go through boxes of your Michael crap anymore. That’s what I mean. Jane: What, why? You can’t just quit. Michael: I’m not just quitting. Jane: Really? Then what do you call it? Michael: I call it walking away from a bad experience. Jane: It hasn’t exactly been rainbows and puppies for me either. At least I’m trying. Michael: I’m trying too, but I can’t do anything right. Like with Michael’s stuff, you won’t let me throw it away, you won’t let me sell it. Jane: Fine, do whatever you want with it. Jane: Then what it is? Michael: It’s that every time I do something or say something, you’re disappointed. And I get it, I’m not him. But it’s also not my fault that I’m different. And River Fields made me realize that I’m the victim here. Anyway, like I said, I’m done. Rose should really be warier about the people she lets into her life, but Rafael also shouldn’t be naive enough to think he could ever hide anything for Sin Rostro. You all know better! Ro continues to be the lightness of the series. Hiring Jason as a ‘real-life’ amnesiac backfired and got his lines cut even more. Hilarious. Xo seems to be doing a lot better though we’re not out of the woods yet. Do you think she’s going to beat cancer? I can’t handle all the cringe-worthy moments with Jason. It’s as if Rose erased his empathy! He wanted his money back for the car Jane sold and thought he remembered a special moment between them before realizing it was just something he’d seen on NCIS. It was a painful realization that one person can be entirely different people based on experiences. Jason really needs to stop making all those googly eyes at Petra! How funny was the scene where Michael walked in on Jane and Rafael? That one is going to sting if he finally regains his memory! What do you think, Jane the Virgin Fanatics? Is Michael really feeling something for Jane? Does he have an agenda? Is he working for Rose? Will Jane go through with the divorce? Make sure to watch Jane the Virgin online so you’re caught up! Share your theories and emotions with me in the comments below!